A destination famed for its oriental heritage, royal palaces and temples, bustling cities and its nature’s immaculate bounty of beauty - Thailand has always been amongst the premiere choices as a holiday destination in Asia. Nature has truly blessed Thailand’s region with abundant and diverse tropical beauty that it is a blissful sanctuary for those who adore nature. Thailand prominently allures tourists through its beach destinations and highlands. Loaded with an incredible assortment of attractions, there is hardly any doubt on why holidaymakers and globetrotters flock to this Asian destination. If you are looking for a countryside vacation in Thailand with off beaten scenic attractions, here is a list of beautiful places in Thailand you can include in your Thailand trip. Among one of the lush green regions in Thailand is Doi Inthanon National Park. 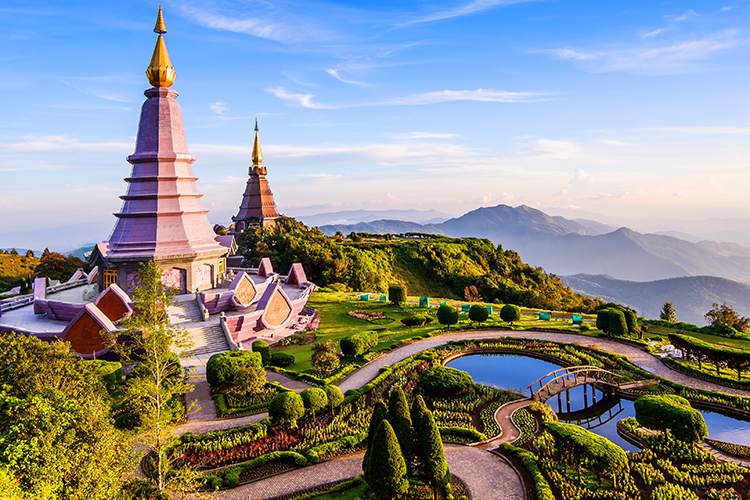 Known as the ‘Roof of Thailand’, this sprawling sheath of misty rainforests teeming with gorgeous waterfalls and an amazing assortment of foliage covers more than 400 square kilometers of Chiang Mai Province in Northern Thailand. This nature sanctuary is also home to Doi Inthanon - the highest peak in Thailand and a popular Thailand tourist spot to visit. A delight for nature and adventure lovers, Doi Inthanon offers countless hiking trails dotted with stunning cascades and scenic viewpoints overlooking picture-perfect vistas of Thailand. If you are wondering where to go in Thailand for a pulsating yet sublime beach experience, head to Koh Lipe. Teeming with laid-back tropical beaches, adventurous water sports and vibrant shopping, dining, and nightlife, Koh Lipe is yet another one of Thailand’s islands that consists of stellar beaches and tropical ambiance. Set in the southwest of Thailand, close to Langkawi in Malaysia, Koh Lipe is one among the idyllic islands of Adang-Rawi Archipelago which is fast gaining popularity amid tourists. Koh Lipe has in recent years gained the attention of adventure enthusiasts for its clear azure waters swarming with rich marine life and coral reefs. If you are looking for a beautiful Thailand beach destination that has the same vibes as Phuket and Krabi minus the overwhelming crowd, then Koh Lipe is the perfect choice for a tropical Thai beach holiday. 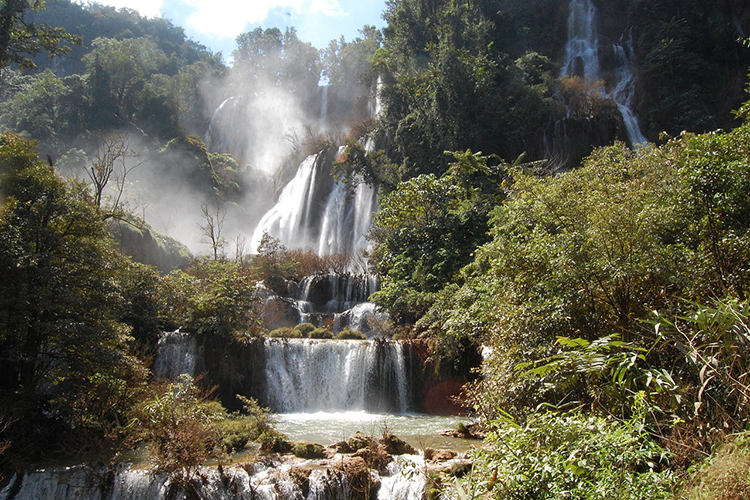 A stunning waterfall with multiple-tiered cascades beguiles your sight at the Mae Klong River. Boasted as the highest waterfall in Thailand, Thi Lo Su Waterfall thunders down from a majestic height of 1400 feet, tumbling on rugged cliffs sheathed in lush foliage. This beautiful waterfall forms a part of Umphang Wildlife Sanctuary which is popular for its dense rainforests and impressive wildlife. A trip to this forest reserve is a great way to reconnect with the splendors of nature and while you are here, you can’t possibly miss the breathtaking vistas of this colossal waterfall. 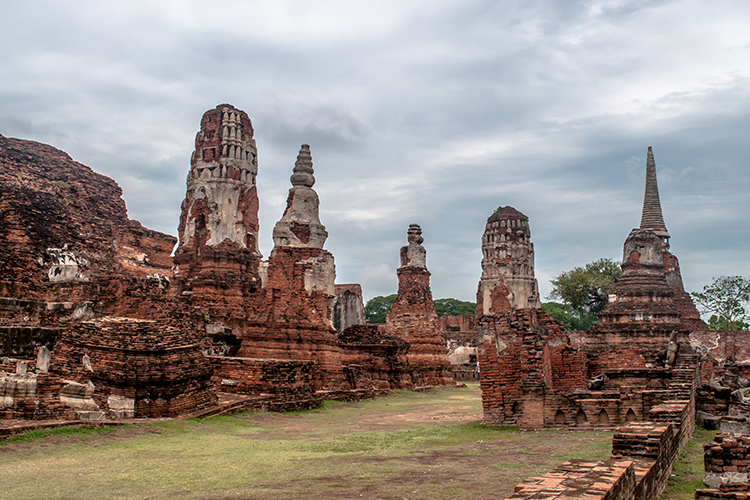 The relics of Ayutthaya take you back to an intriguing era of Thailand. Once a prosperous Siamese city reduced to ruins by the Burmese in the 18th century, it has managed to shield its heritage through all these years so that as time flies, the world can still marvel at these heritage splendours. Set on the outskirts of Bangkok, roughly an hour away, the city is a stark contrast to Bangkok’s contemporary ambiance which is why Ayutthaya is one of the popular places to see in Thailand as an excursion from Bangkok. Honoured as a UNESCO World Heritage site, travellers flock to this Thai attraction to marvel the incredible architecture and intricate designs of the palace and temple ruins. One of the jaw-dropping attractions here is the Wat Phra Mahathat where nature’s beauty merges with the sculptures and structures to give you an antique ambiance. 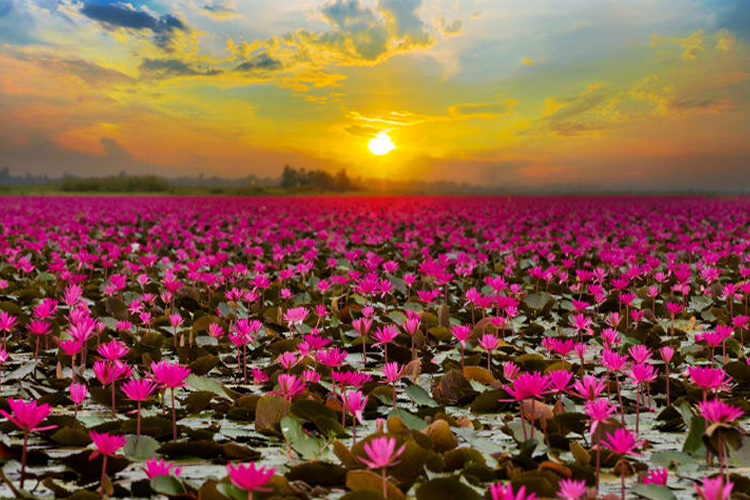 One of Thailand’s gorgeous seasonal attractions is the Red Lotus Sea. Originally known as the Nong Han Lake, it is during the months of November to February that this ordinary looking lake is blanketed in a riot of rosy hues. The lake has countless red lotus plants that bloom in the cooler months offering its visitors mesmerizing sweeping vistas of the lake covered in pink and red shades. This surreal sight makes this lake one of the extraordinarily beautiful places to visit in Thailand. Located in Kumphawapi district in Udon Thani Province, Northern Thailand, the lake is an amazing option as an off-beat excursion for travellers visiting Thailand. 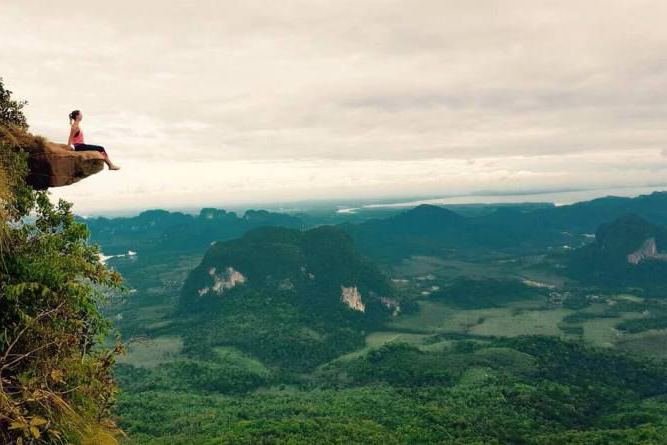 Located in Krabi, the Dragon Crest Mountain or Khao Ngon Nak is a hiker’s haven. 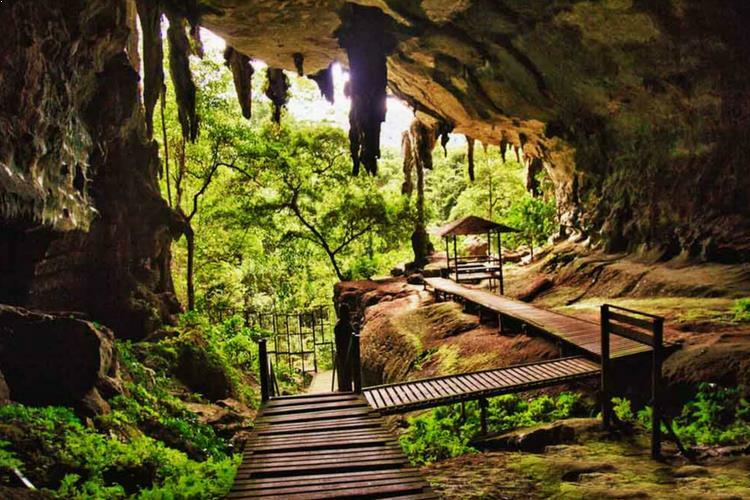 Head for a 3.7 kilometer hike and you get to witness one of the scenic natural landscapes of Thailand. A 30 minute drive from the city centre takes you to a lush natural wonderland brimming with fabulous viewpoints that gives out postcard-perfect vistas of waterfalls, streams and the bountiful, verdant forests. An excellent way to embrace nature in calmness accentuated by the sweet sounds of nature, this is just what you need to recharge yourself before you get back to the day-to-day hustle of life. Thailand’s very own version of ‘Stonehenge’ - Mor Hin Khao located in Laenkha National Park at Chaiyaphum province is a unique natural attraction that consists of a collection of strange rock formations scattered amid fields of tulips and wildflowers. These unusual geographic structures are basically enormous rock columns carved by nature with its constituents of white sandstone, black granite, purple sandstones gives vague hues to these rock pillars. Together with the blossoming foliage, the landscape looks absolutely breathtaking. And while you are here, do take the opportunity to venture around the national parks’ beautiful attractions, impressive waterfalls, and scenic viewpoints. 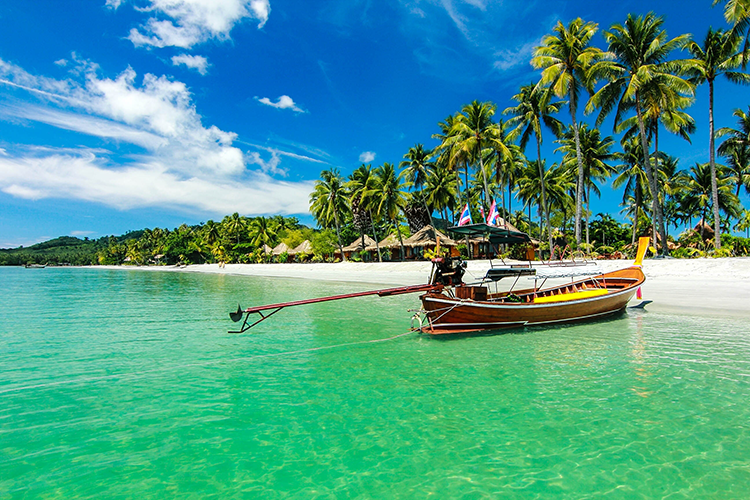 From barefoot strolls along the seashores, to mesmeric landscapes and refreshing nature blisses, Thailand is the place to be if you are a beach, adventure, and nature lovers. So explore Thailand’s stunning beauty - get your Thailand visa sorted and add some of these off beaten beautiful destinations along with the usual Thailand tourist places to enjoy an exceptional Thailand holiday experience.